After a franchise-tying record of four consecutive seasons losing 90+ games, the Minnesota Twins ended the half-way mark of the 2015 campaign with a promising (and surprising to many) 43-38 mark through Saturday. The Twins’ historically poor record during the first four-plus years coinciding with Governor Mark Dayton’s administration – losing 383 games from 2011 through 2014 – has not derailed talks of new sports facilities across other Gopher State franchises during his tenure. In 2012, a new Vikings stadium proposal was passed (with more than 50 percent of the costs financed from the state and City of Minneapolis) although public support for a Major League Soccer stadium for a new Minnesota franchise seems tepid at best. (An expansion of Target Center, the home of the Minnesota Timberwolves and Lynx, was also inked in 2013, though the only public funding came from the the City of Minneapolis). Despite the Twins’ long stretch of disappointing seasons, the team has been enjoying healthy attendance at their ballpark, coinciding in no small part with the opening of Target Field in 2010. However, attendance has dropped off every year since the stadium’s inaugural 2010 season when 3,223,640 fans came to see the Twins play home games. Attendance is on pace to decline again this year from 2014 despite the team’s winning record and is projected to be down 34 percent from 2010. So just how bad have the Twins been during the Dayton years? In short, the DFL governor should be thankful the stadium deal was on his predecessor’s plate back when the team was the darling of the League. Through Saturday, the Twins had compiled a record of 308-421 (.422) since Dayton took office in 2011 – the worst record for the team during the administration of any governor since the squad arrived in Minnesota in 1961. Prior to Dayton, the worst stretch of Twins baseball came during the tenure of Republican Al Quie. From 1979 to 1982, the team won just 260 games against 334 losses (.438). During that period the team moved its home field from Metropolitan Stadium in Bloomington to the Hubert H. Humphrey Metrodome. The current Twins stadium, with hundreds of millions of dollars funded through a Hennepin County sales tax, was approved and signed into law by Governor Tim Pawlenty in 2006 – after the Twins had notched five consecutive winning seasons following a stretch of eight losing seasons dating back to 1993. Indeed, the Pawlenty years were in some respects the headiest in Twins’ history with the ball club claiming five division crowns in eight years (2003, 2004, 2006, 2009, 2010). 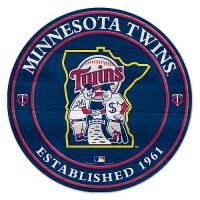 The Twins had only five such titles over the previous 34 years since division play began in 1969 (1969, 1970, 1987, 1991, 2002). Overall, Minnesota won 709 games during the Pawlenty years versus just 589 defeats for a .546 winning percentage. That’s a recipe for (legislative) success. (Note: It also didn’t hurt that the stadium deal was reached prior to the state and national economic downturn of 2008). The Pawlenty years saw the best stretch of baseball for the team in decades dating back to the administration of Republican Harold LeVander (1967-1970) when the team won 365 games against 283 losses (.563). The only other governor to enjoy winning baseball in Minnesota across his tenure was DFLer Karl Rolvaag (1963-1966) at 361-286 (.558). Republican Elmer Andersen saw the Twins play even .500-ball during the team’s first two years in the state (161-161). But perhaps the biggest political cheerleader for the Twins in recent years has not come from the governor’s office but rather from former Minneapolis Mayor R.T. Rybak. Rybak saw the Twins play winning baseball during his 12 years in office for the 2002 through 2013 seasons (998-947; .513) – the only mayor of Minneapolis to see that since the franchise started playing home games in the City of Lakes in 1982 after 21 seasons in Bloomington. The Twins played .486 baseball with Don Fraser in office (945-999), .442 with Sharon Sayles Belton (543-685), and .465 thus far with Betsy Hodges (113-130 through Saturday). Of course, it was Fraser running the city when the Twins reached the pinnacle of their success – winning two World Series crowns in 1987 and 1991. Be the first to comment on "Minnesota Twins Record by Gubernatorial Administration"